The expenditure report submitted by the BSP to the Election Commission stated that the party has an exuberant bank balance of Rs 669 crore deposited in eight accounts at various banks in Delhi. When it comes to political expenditure Bahujan Samaj Party (BSP) supremo Mayawati knows to keep itself buoyant as the party is reported to be flooded with funds. According to official reports, the BSP has an exuberant bank balance of Rs 669 crore deposited in eight accounts at various banks in the national capital. The expenditure report submitted by the party to the Election Commission (EC) states that BSP also has Rs 95.54 lakh as cash on hand. Along with BSP, its alliance partner Samajwadi Party (SP) led by Akhilesh Yadav comes next in the line with Rs 471 crore as its party funds. 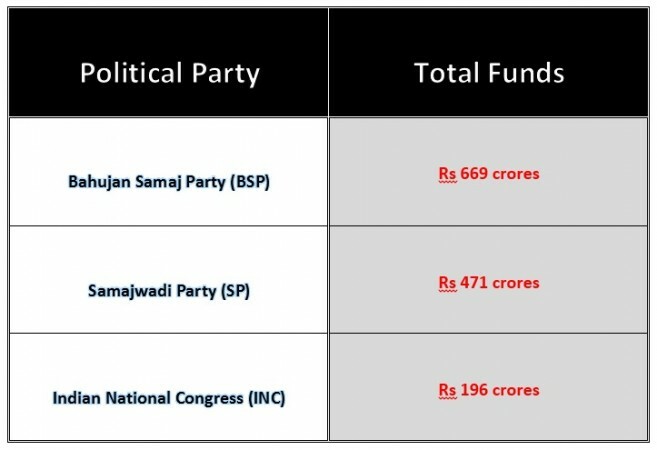 The political association of SP-BSP has gathered a huge amount for its party base, making them the richest political parties in India. According to the media reports, SP lost some of its deposits (Rs 11 crore) while BSP has improved its reserves and gained Rs 5 crore after the recent assembly elections in Rajasthan, Telangana, Madhya Pradesh and Chhattisgarh. The Indian National Congress (INC) acquires the third place with Rs 196 crore as its bank balance as per the EC reports submitted in November 2018. As the party hasn't updated the details since the recent assembly elections. Telugu Desam Party (TDP) comes next with a cash deposit of Rs 107 crore followed by the Bharatiya Janata Party (BJP) takes the fifth spot with a bank balance of Rs 82 crore. The amount submitted by the BJP seems rather small considering the party's network and the contributors it has. BJP is claimed to have raised Rs 1,027 crore out of which they had spent a total of Rs 758 crore for the 2018 assembly elections. This is reported to be the largest expenditure ever by any political party, reports TOI.